We will be taking a break from our guided tours this month, returning again for Spring in September. 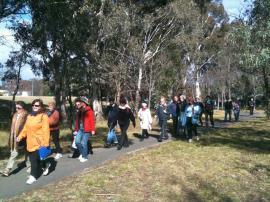 Our Wednesday Weekday Walks will continue for all those keen to take a social and invigorating stroll at lunchtime. - The 2012 Capital Jazz Project produced by The Street Theatre and ANU School of Music runs from August 3-12, featuring 160 international, national and ACT-based artists, 22 performances, and 28 ensembles. - The National Film and Sound Archive’s ARC Cinema is presenting a month of special screenings to celebrate its fifth birthday – and the arrival of state-of-the-art DCP digital cinema projection. - National Science Week runs from August 11-19. This is a great opportunity to enjoy and explore the wonders and benefits of science, with over twenty activities and presentations in the Acton Precinct alone. Visit our What’s On Calendar for information on these events and many more. We look forward to offering you more guided tours in September, and as always, welcome your feedback and suggestions for walks or activities you would like to see on our program.